Do you have a great App idea for the automotive industry but cannot find the channel to gain insights and support from the industry experts? Here is your chance to turn your idea into reality! Welcome to Audi App Jam! 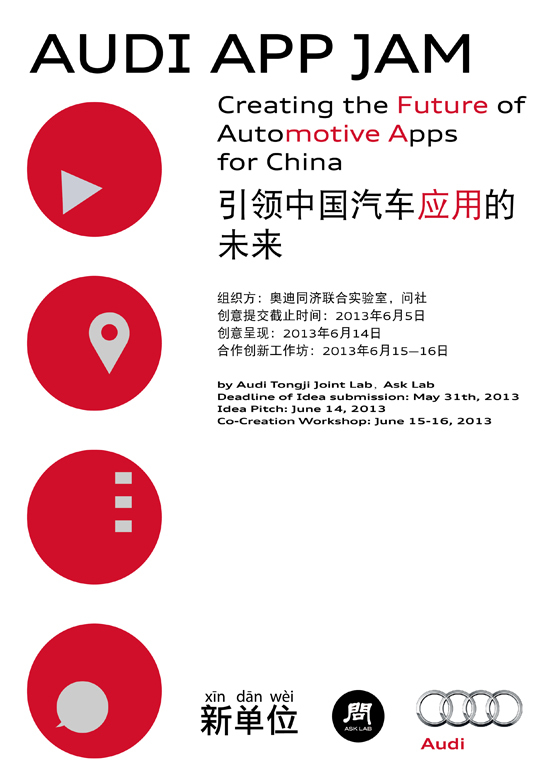 We are looking to empower people who have ideas or talents to build App concepts for the automotive industry by providing them with industrial knowledge, professional mentorship, prizes and most importantly, the direct connection with Audi China’s marketing and product development team. We are calling on people from areas such as design, information technology, digital media and marketing, to develop innovative, market-relevant and interesting App concepts. We are searching for cool App concepts which are exciting, individualized and sociable. You can submit your idea/talent HERE. The deadline of submission is 11:59 p.m. Beijing time, 5 June, 2013. What kind of apps are we looking for? We are looking for innovative App concepts that provide real value for the Audi customer. We seek App concepts that have not been seen before or are being taken to a new level of development. We want new App concepts that enhance the user experience of Audi, while conveying the style and values of the Audi brand at the same time. A winning concept should be overwhelming in function, use-ability, emotion and beauty. The App should be intuitive, understandable and user friendly. It is important that the main function of the App is easy to reach and controllable. The App needs to be relevant and meaningful to Audi’s brand. We are looking for automotive App concepts in the following three categories. Contestants are free to suggest extraordinary Onboard Apps. But we are looking for more input in categories 1 and 2. 1.) The Smartphone App：This is a car-related app which purely runs on a Smartphone only. You can use these Apps whether you are inside or outside of the car. 3.) The Onboard App： These kinds of Apps run only inside the car using the car multimedia interface. They cannot be used outside of the car. Apps of this category need to fulfill extremely high safety standards. Therefore, implementation, lead time and testing need far more time than a pure or hybrid Smartphone app. In terms of function, we are looking for Apps in the following areas, but the list should not limit creativity. A. Information Apps provide car data, service oriented function, execution functions, personal log book etc. Service oriented functions enable Location Based Services that locate the car, provide local information, directions etc. Execution functions remotely control the car for services such as heating, door locks etc. Car data provide the customers with information about the car service and usage such as fuel and oil gage, tire pressure etc. B. Lifestyle Apps provide the customer with information and connections to services that enhance ease of function in areas such as: sports and re-creation, health and wellness, fashion and style, hobbies, social networking, travel, shopping, pets, magazines, personal finance, household management etc. C. Entertainment Apps provide video on demand (VOD), films, drama, TV series, culture, documentaries, music and music videos, animations and user-created content, audio books, e-learning etc. How does Audi App Jam work? 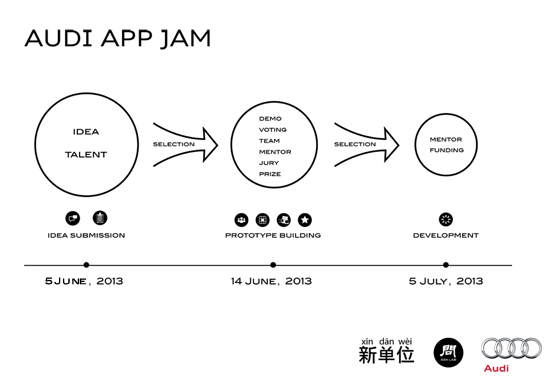 Ask Lab presents Audi App Jam in three steps: Idea Submission, Prototype Building and Development. Ask Lab presents an online open contest to communicate project challenges to the public. 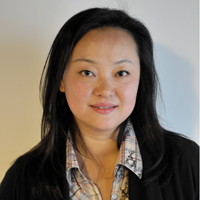 We give people information about the challenges Audi China is facing so that user needs can be identified. Applicants can then provide innovative ideas and talents to address those needs. We are looking for both IDEAS and TALENTS. People can apply with an IDEA and/or explain how they have the best TALENT to support others ideas. A professional jury will select people with ideas and/or talent to enter into the next “Prototype Building” phase. Your idea can be presented in any design or choice of format. There are no specifications to adhere to. You can submit your idea/talent in the form of presentations, text documents, images or video files in the upload form. We encourage people to make the most of the opportunity to evaluate the ideas by asking for feedback on the project page of Xindanwei. By doing this our team will be able to contribute to the improvement of your ideas. On the evening of June 14, 2013, applicants who have been selected with an idea will be invited to pitch to the crowd and jury. The five best ideas will be selected and teams will be formed around those ideas. They will be joined by a pre-selected student team. Teams will work over the next two days in the prototype building workshop to further develop their concepts. Teams will be supported by some of China’s best design, technology and business mentors. Resources will be provided to assist the teams to fast-prototype their ideas. At the end of the process the six teams will need to demonstrate their prototype to the jury with a chance of winning 25,000RMB per team in cash to further develop their prototype into a presentable App within 3 weeks. (20% of the prize money will be paid up-front, the rest being paid on the final delivery on July 5, 2013). There is also the potential of being licensed for the product to be made available for Audi. For the teams whose prototypes are selected as the winning concepts, Ask Lab will work with Audi China to support you even further with mentorship to help you move to the next level. Audi Tongji Joint Lab (ATJL) and Ask Lab develops and facilitates Audi App Jam in close cooperation with Audi’s headquarter in Germany and Audi China in Beijing. 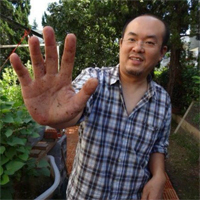 Ask Lab is a social enterprise built upon Xindanwei, the first coworking community in China. Ask Lab is an interactive training program in research skills and creative thinking, based on ‘Design Thinking’. Ask Lab is designed to bring organizations and talents together, to unleash creative potential and turn brilliant ideas into innovative, scalable solutions for your and societal challenges. Audi is a leading brand for premium cars worldwide. In China, Audi has led the premium car market for more than two decades already. With its claim Vorsprung durch Technik and with China as the largest market for the brand, Audi is continuously striving hard to keep its leading position. The “connect” services, which were introduced to China last year, are based on Audi’s award winning MMI technology which was introduced to China in 2005. The concept is completely tailored to the requirements of customers in China, including a touchpad to allow the input of handwritten characters. Audi’s aim is to keep the lead as the benchmark in user interface which can be experienced by our customer every single day they drive in an Audi. Audi Tongji Joint Lab (ATJL) is a partnership between Audi and Tongji University. As Audi’s research outpost in Shanghai, ATJL is exploring new approaches to overcome traditional industry borders and culture gaps. 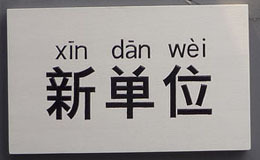 Disclaimer can be found in the Chinese text. Yes. If you are interested in using your creativity and creating Automotive Apps, you are welcome. App Jam gathers people from different backgrounds including technical (developers, coders designers) and business (marketing, finance, law). Participants will work in teams with like-minded, inspired, and skilled members to develop future automotive killer Apps. If you have either “ideas” and/or “talents” in design, information technology, digital media, marketing etc, this event is for you. Can I participant with my team? Yes and your team should consist of people from different specialties-a designer, a programmer, a marketer, etc. There is an application form where you can register. Can I register with more than one idea? For sure. The more ideas you have, the more you are welcome! Yes, you can. On the condition that you are not working on your ideas with any other automotive companies. Don’t give up. Please try again for our next project. No. You can just come with your ideas or talents! Either Chinese or English is accepted. What should be included in the idea? You should include the target group, the function your automotive App performs (e.g. information, lifestyle, entertainment), how your App works (function description/user scenario), and what hardware is required to use your App (screen, camera, smart-phone, tablet etc.). Can I join without any particular idea in mind? Yes. If you have special talents, you can join without any idea. Who is the organizer of this workshop? What is Audi’s role in this? Audi Tongji Joint Lab (ATJL) and Ask Lab develops and facilitates Audi App Jam in close cooperation with Audi’s headquarter in Germany and Audi China in Beijing. Ask Lab works with startup and creative professionals to solve challenges presented by businesses and organizations. Audi China initiates their challenge as the key theme of this workshop and they are also the sole sponsor of this event. How do we deal with Intellectual Property? Do I have ownership of my idea? Participants have ownership of their ideas and keep all rights to the concept they submit. In case Audi is interested in the concept, there will be an exclusive licensing agreement between the participant and Audi. The final price should be within the range of a reasonable market price. If Audi and the participant cannot reach a preliminary agreement within a mutually agreed time, Audi will no longer enjoy the exclusive right. How can I protect against project sponsor or others from stealing my idea? In reality you are not totally protected at the idea stage and the truth is that your cool App idea may have already be developed somewhere else in the world. This does not however mean that your idea isn’t a good one or worth pitching for the App Jam. However, you are welcome to share the key points of your idea that will get people excited but you do not need to reveal the entire idea in the first instance. What if I use an element in my idea that the project sponsor or someone else already uses? This is ok, as long as the idea is a development and ultimately new for Audi China and not a direct copy of another product. We will select the best ideas pitched, forming teams for these ideas and using the Design Thinking process we will provide assistance and resources to help the teams to fast prototype their ideas. What outcomes are expected from the workshop? 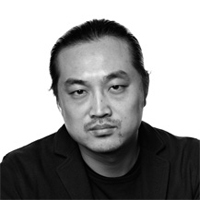 We expect teams to build App prototypes designed specifically for Audi China. The App designs are expected to be new, innovative, understandable and user friendly and to inspire Audi China to take the winning Apps to the next level of production. How can I get invited to join? Can I join the prototyping workshop without being invited? You cannot join the prototyping workshop without being invited. Who are the professional mentors? David Li, Foreman of Xinchejian. Specialties: Large scale network software system architecture. 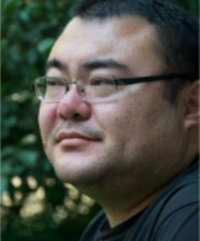 Currently focusing on online game middleware in Chinese and Japanese market. An idea author you can explain the talents they need and invite speciic people to join their team. Talents can pitch to join an idea/team and can also reject offers. The team discusses how the prize money should be split. In case of winning, Ask Lab will transfer the prize money to the idea author’s bank account. The idea author is responsible for transferring the agreed on parts to the talents. How does the community voting work? The community voting system is based on collective intelligence: the votes of many determine the best ideas. What kind of resources and assistance are provided for the prototyping workshop? Industrial/sector insights, channels, professional mentorship, and the potential of prizes, scaling opportunities, incentives even job opportunities and even seed funding for your idea’s. The 3 winning teams will be supported with 25,000RMB per team to further develop the idea. 20% of the prize money will be paid upfront, the rest being paid on the final delivery on July 5, 2013. There is also the potential of being licensed for the product to be made available for Audi. What can we do with the prize money if we win as a team? The prize money is to further develop your prototype into a presentable App within 3 weeks. The event organizer will neither be involved nor in the way you allocate the prize the money nor be responsible. Can I talk to the project sponsor Audi further after the prototyping workshop? For sure, if they are interested in your prototype or specific talents. What happens in the development phase? You will work with your team and mentors to further develop your prototype into a presentable App within 3 weeks. What outcomes are expected from the development? To make the App demo on a Smartphone including all the major features of the app. How can I get invited to the development phase? What kind of resources and assistance are provided for the development process? Each mentor will provide you with their professional advice and assistance at least 2 times during this process. Who is Ask Lab? What does Ask Lab do? Ask Lab is a social enterprise built upon Xindanwei, the first coworking community in China, with partners across Asia, Europe, US and Africa. Ask Lab is an interactive training program in research skills and creative thinking, based on ‘Design Thinking’. The outcomes from Ask Lab include inspiration, transformation, confidence and ownership to start your next individual and organizational endeavor. This isn’t just about generating ideas. It’s also about making the ideas happen! How can I be informed about the future projects of Ask Lab? Go to xindanwei.com and sign up, and keep visiting our blogs at asklab.org.